Let's make it easier and less expensive to buy coffee! 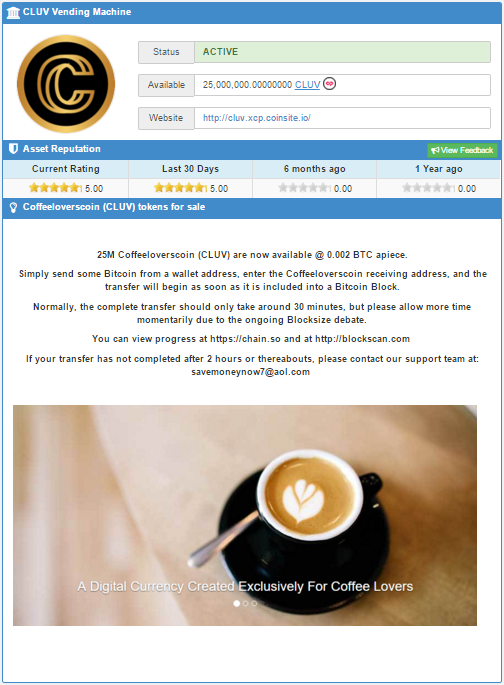 Coffeeloverscoin (CLUV) is the result of a team of us who joined together to create a coin that will help coffee lovers around the world purchase premium coffee through their favorite corporate and college locations at a discounted price, utilizing the new digital currency Cofferloverscoin. Great coffee is not always offered at a great price. As the value of our coin increases it is our desire that the price point, amount, and quality of the coffee purchased through the coin will bring great savings and satisfaction to coffee lovers everywhere. It would be our goal to see the coin sustain a value that would really make buying coffee like collecting points on your favorite rewards card where you would have enough Coffeloverscoin to pay for your daily coffee consumption for life, making gourmet coffee a budget line-item that get's taken care of forever through Coffeeloverscoin. The brilliance of Bitcoin is that it can be utilized to purchase almost anything around the world. Similarly, Coffeeloverscoin was invented so that Coffee Lovers can buy the commodity coffee in bulk or at their favorite coffee house or franchise and be able to utilize a viable digital currency that will give them great value and also over time give them discounted negotiated pricing/rewards and can be utilized around the world to buy coffee. The exciting thing about more specific digital currencies is that instead of trying to be all things to everyone, we can focus on one thing and do it well. Coffee is well loved around the world and it's our goal that the rewards associated with using Coffeeloverscoin™ will bring great satisfaction to coffee lovers around the globe. Perhaps the Bard of Oxford said it best regarding good coffee: We now settled into a routine which has ever since served in my mind as an archetype, so that what I still mean when I speak of a "normal" day (and lament that normal days are so rare) is a day of the Bookham pattern. For if I could please myself I would always live as I lived there. I would choose always to breakfast at exactly eight and to be at my desk by nine, there to read or write till one. If a cup of good tea or coffee could be brought me about eleven, so much the better. ~C.S. Lewis. A huge thanks to Creator DonAlexander for bringing this digital currency to life. Brewing relationships with the most famous coffee houses you know! Percolating partnerships with private and public colleges and universities nationwide! Batch roasting connections with coffee magazines! Machine drying a platform for our investors that will include simple easy to use wallets to buy and sell Coffeeloverscoin (CLUV) around the world! We want to do a lot of stuff; we're not in great shape. We didn't get a good night's sleep. We're a little depressed. Introducing 'Sarah' the new face of Coffeeloverscoin™! With a big yellow heart on her chest and an even bigger heart on the inside, Sarah loves to say "Coffeeloverscoin!" 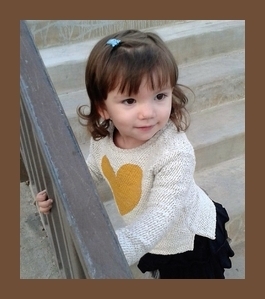 with all her might out loud in the tiniest cutest 'Little-Girl' voice ever!. Chosen for her beautiful coffee-brown eyes and contagious gorgeous laugh, Sarah loves to eat chocolate marshmallow candy squares or coffee cake while the mocha is brewing!" Add the water, grind and brew.